For many years, the mid-size truck market languished. Until finally several of the big players vacated the segment leaving only the Toyota Tacoma and Nissan Frontier as options. We went years with no Ford Ranger or Dodge Dakota before the Ranger returned, and Dodge is still not in the segment. Today we have mid-size trucks from Toyota, Ford, Chevrolet, and Nissan. Even Jeep is also coming back to the mid-size market with the Gladiator. Ford is set to bring back an even smaller truck that will undoubtedly be less capable but will be less expensive to purchase potentially known as the Ford Courier. The compact Ford truck was confirmed recently by Jim Farley, Ford’s president of global markets, in a chat about the automaker’s plans at the Deutsche Bank Global Auto Industry Conference in Detroit, reports Automotive News. Farley gave up no real details about the truck, only stating that it would slot below the Ranger. Farley stated at the conference, Ford is “investing in more affordable versions of our truck business,” and he also noted that “you can expect new nameplates below where we compete today.” No indication of a timeframe for when the truck might debut was offered; a Ford spokesman later stated, “we’ll have more details to share about new nameplates in the future.” Ford sold a compact truck called the Courier in the U.S. many years back and sold a Fiesta-based truck in Brazil under that same name until 2013. Ford has filed a trademark on the Courier name for the U.S. market. As of now, sources claim the name for the truck isn’t locked in, but that the Ford Courier name is the frontrunner right now. Ford also sold a car-based pickup in the past called the Ranchero, that name is a possibility for the small truck. Rumors have also suggested the truck might land in 2021 as a 2022 model. 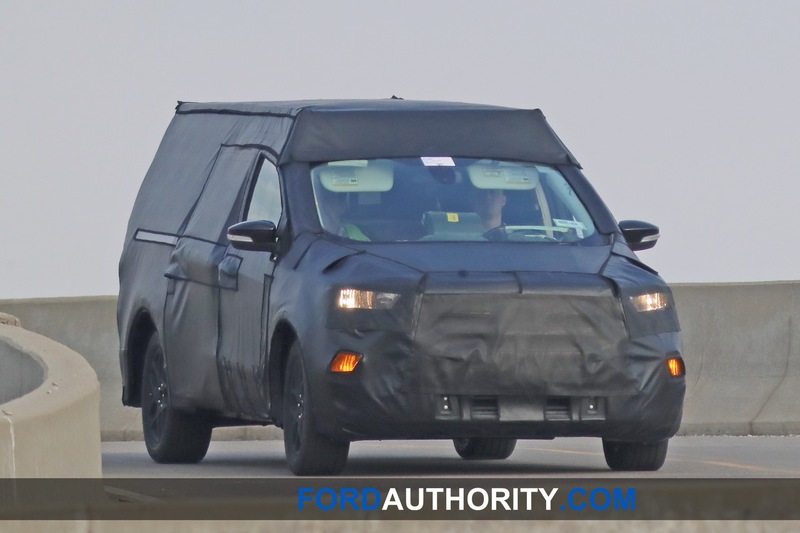 Last month, some spy shots turned up of the small Ford Courier truck in testing, under all the camo you can almost make out an F150-style grille. The new truck could bring back the ’90s era when if you wanted a cheap vehicle, a mini truck fit the bill. Give it a good 4 cylinder (or 3 cylinder turbo) and a stick and I’m in! The small Az town I live in has narrow streets and the small stuff works. Maybe an electric power plant ? Ford has had the Courier nameplate, in some form or another, back as far as 1955 with the two door panel station wagon. Check it out. I keep a 1995 ranger running just for this reason, it’s small, it does what I need it to do, and not a load of things I don’t need. Bring a base model with no extra electronics, keep the price around $19,000. you will have a winner.